Most people deal with some level of workplace stress. 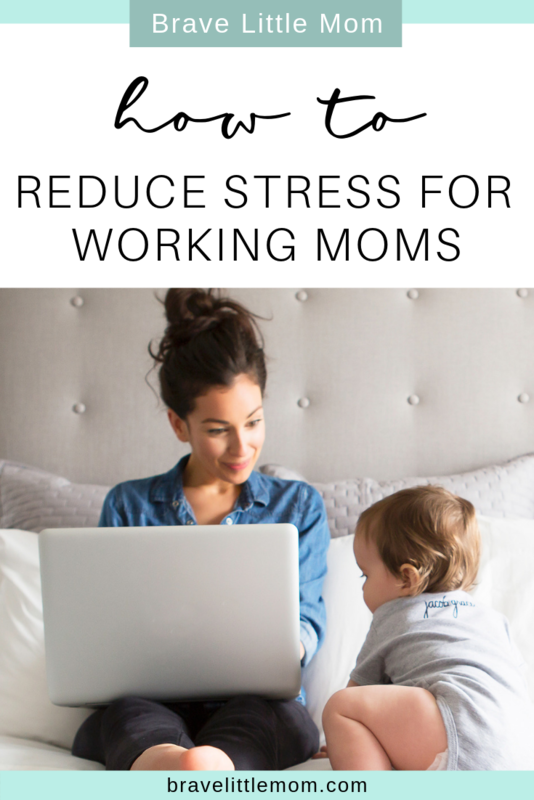 Nearly everyone is looking for ways to reduce stress, especially modern working moms. When life seems to move at such a fast pace and there are endless tasks to juggle, the long hours often expected of employees only add to the stress. Learning how to manage stress is critical for a happy and healthy lifestyle. It is even more so for working moms trying to figure out how to reduce stress overall. Barring those nights when the kids just won’t stay in bed or the baby is teething, you won’t feel rejuvenated in the morning or ready to take on the day if you’ve had a bad night’s sleep. Sleep is critical for your body’s recovery, yet so many moms simply don’t get enough of it. Unfortunately, there isn’t much to do about a fussy baby. However, if you’re struggling to nod off because you still have work on your mind, try removing distractions from your sleeping space. Practice breathing exercises or try journaling to get those thoughts of work out of your mind before you drift off. Of course humor is not appropriate for all stress-related scenarios, but it can provide some light relief in many cases. Find a way to lighten your mood. After a long and stressful day at work, host an impromptu dance party in the kitchen with your kids or snuggle in for a comedy with your partner. We like to play a silly impressions game at dinner on those rough nights. We take turns acting out a funny line from a movie or pretending to be a character or animal, and then everyone else has to try and guess. We don’t keep score or name a winner. It’s simply a fun game to lighten the mood and get everyone laughing. Sometimes we also play little quiz games where we have to answer silly questions about one another. See all the questions I asked my kids that night here! Feel-good foods, such as baked goods and sugary snacks, lead to an improved mood for a short time. Inevitably, though, you’re left with the big energy crash, a killer for working moms trying to reduce stress. Try to limit trans fats, alcohol, caffeine, and food with a high amount of chemical hormones or preservatives. If you set unrealistic goals, you’re setting yourself up for failure. This can lead to feeling disheartened and demotivated. When looking to reduce stress at work, confidence is key. Setting realistic goals helps you maintain your confidence (among other things) because you are always or often able to meet your objectives. Try setting SMART goals. SMART goals are specifically goals that follow a tried and true format designed to help you actually achieve your ideal end result. Need more help setting your SMART goals? 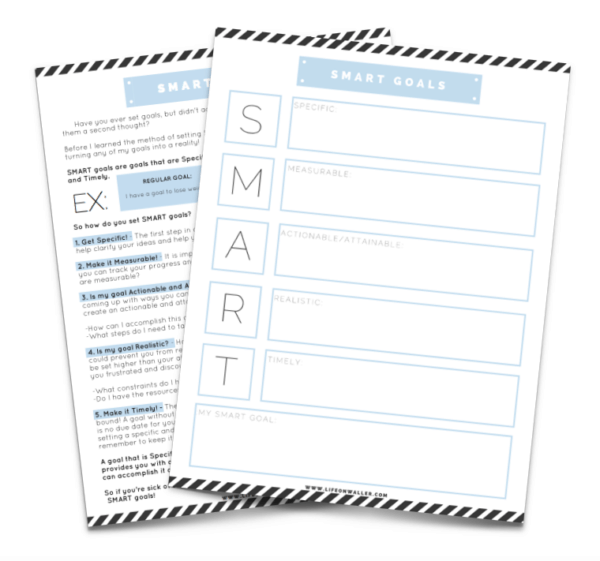 Try this free printable SMART Goals worksheet from Cassie Scroggins! Scheduling your day can help working moms reduce stress because it gives you a clear focus. Rather than simply trying to push, push, push for the full 8-10 hours of your work day (and then come home to a stressful weeknight with your family), use strategies like scheduling and time blocking. A daily planner you carry with you or a scheduling app on your phone or computer at work will help with setting and maintaining a stress reducing schedule. I highly recommend the LifePlanner by Erin Condren for this. I use the hourly planner which allows me to time block each day, as well as track monthly events on a calendar style page. It is by far the best planner I’ve ever used! There are numerous steps you can take to achieve better task management to reduce stress at work. These include making compromises, delegating responsibility, breaking projects into smaller steps, and prioritizing tasks. Don’t forget the value in asking for help and managing your energy levels, too. Sometimes, energy management is even more effective than time management. It allows you to gauge your tasks by your energy output rather than a clock. One of the main sources of stress is constant interruption throughout the day. 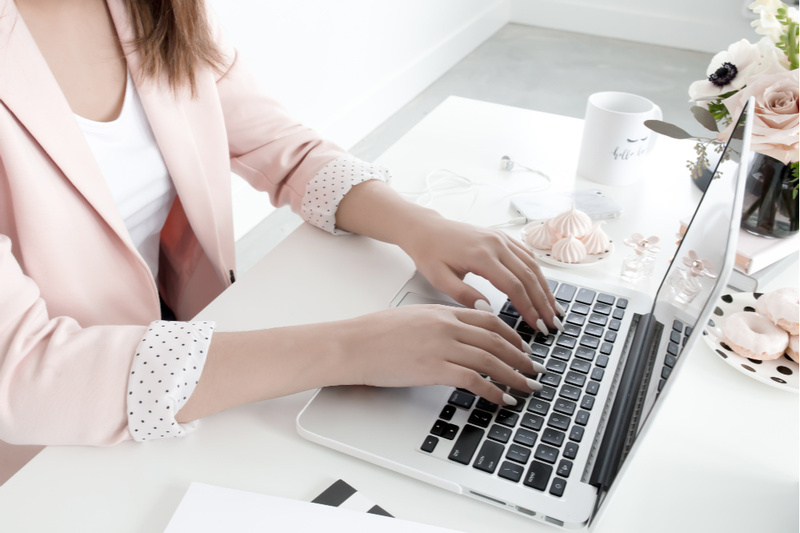 While it can be unavoidable in the workplace, most people feel bombarded with instant messages, emails, and phone calls. Instead of dealing with every interruption as and when it comes, set a designated time for checking emails and messages. Using a strategy like time blocking, establish a routine time to check emails mid-morning. Schedule office hours where coworkers are free to drop in for spur of the moment questions or discussions. You can even try creating a co-work hour where you and your peers at work collaborate for a designated amount of time in a communal space. Getting up before the kids has become essential to my becoming a morning person and reducing my stress as a working mom. Take it a step further, and try to leave just 10 to 15 minutes earlier every morning. You’ll be shocked by how much of a difference this small change makes. I now arrive at work feeling more relaxed, and I’m able to ease into my day as opposed to running around frantically trying to get to work, settle in, and get started. The power of a deep breathing is often underrated. I talk a lot about self-care and stress management, and breathing exercises are often a big part of that. Just a few moments can restore balance if you’ve come out from a tense meeting or are feeling overwhelmed. Regain focus and find your calm, momma. A lot of people smoke a cigarette to calm them down, and after speaking with a therapist at length about this, some of the benefit to that is attributed to the act of deep, slow breathing (see above). However, nicotine is a powerful and harmful stimulant. It increases anxiety levels as opposed to reducing them. Instead of grabbing a smoke break after that stressful meeting, try finding a quiet place and just breathing. Talk to your doctor – A lot of people deem it unnecessary to talk to their doctor when they’re quitting smoking. However, studies show that speaking to a doctor actually increases your chances of successfully saying goodbye to cigarettes once and for all. It is, after all, a health-related matter, and that is what your doctor is there to help you with. Change your diet – Some studies have shown that certain foods make cigarettes taste better while other foods make it taste worst. So, what do you need to give up? Coffee (sorry, momma), alcohol, and red meat can all enhance the flavor of cigarettes. However, fruit, vegetables, milk, and juice are said to make cigarettes taste worse and seem less appealing overall. Stress often occurs when you are put in situations that are not in your control. Working moms are often wearing a multitude of hats all day. They manage work while simultaneously plan for next week’s meals and keep track of which kid needs their next round of vaccinations. The best approach to deal with stress is to sit down and determine what aspects of your day you can control. Focus your energy on those and let go of the rest. Regular exercise is a powerful stress reliever. On multiple visits to my own therapist, exercising to reduce stress has been a strategy my doctor has brought up. Unfortunately, it can often be difficult for working moms to reduce stress with exercise when they already feel tapped out on time and energy. Instead of attempting a 30 minute gym session, try taking a stroll outside whenever you feel stressed at work. Or grab a spot in an empty conference room and do a quick 10 minute yoga flow. Engage in aerobic activities when you can that will make you sweat and increase your heart rate, such as swimming, dancing, and power walking. I’ve even just walked the stairs with a book on my breaks before to reduce stress and get moving. Working moms are our own worst critics. There are times when we are happy to beat ourselves up—I’m thinking of the time I dropped about half of the balls I juggle at any given time and felt like my world was collapsing. It’s so easy to engage in those negative thoughts, but do you pump yourself up and encourage yourself, too? Try rewarding the hard work you’re putting toward reducing your stress by focusing on the amazing things you’re accomplishing. You work and raise a family! You’re amazing, momma. These positive affirmations for moms have really helped me, as well! I place mine around my desk, my work space at home, and on my bathroom mirror. Whenever I see one, I say it to myself as a reminder that I am doing my best, and that’s okay. Check out The Military Wife and Mom for even more positive affirmations you need to be saying to yourself every day. Nature’s antidote to stress is social contact. Talking face-to-face with a good listener is an excellent way to relieve stress and calm your nervous system. So, find your mom tribe. Those moms might be a groups of friends, family members, co-workers, or an online group of moms who just get it. Choose a mom tribe that makes you feel at ease with yourself. Focus on developing friendships and opening up as you feel comfortable doing so. From rewarding hard work to maintaining a healthy diet, there are many different ways for working moms to reduce stress at work. By making even just a few positive changes, you can make a big difference in your overall happiness and wellbeing. I definitely need to work on getting more sleep! The other things – I should get more organized, for sure. Thanks for the tips and the tools. I’ll have to try some of these. Great advice! I love what you said about “acting instead of reacting”. And yes, I recommend the Erin Condren planners! Makes planning and organizing so much fun. This is such a great reminder, I truly love this! I love your S M A R T idea! I also like the planners you list. I really need to start using one! BTW your blog is so pretty! Eating right is a hard one for me. I really need to do better. It was really hard for me to do at the beginning, too! I’ve found that precooking meat and some pastas helps me, and I keep steamable vegetable packages and quick cooking couscous and rice on hand for those days when I just don’t have the time or energy to make something from scratch. My goal is to have healthy options that are just as easy as reaching for a bag of chips. I am so stressed – I really need to take a day where I can get things back in order and start fresh with some of these tips. It’s so true how everything goes together. But the busier I get, it’s hard to eat healthy and get enough sleep! I totally understand! Sometimes reducing stress can be stressful in itself. I’d recommend seeing if you can find a way to take that day to get fresh. Sometimes I’ll take a mental day off at work for this or ask a friend or family member to take the kids for the day. Having that catch up time helps me so much! Sleeping well and not taking myself (or the bad days) too seriously are what keep me sane. Those are great tips! I know I feel like less than a human when I’m not sleeping well, and it makes life so much harder to manage. Sleep, water, exercise, good FOOD! Food replenish our system and lots of vitamin C to help the inmune system. I’m not a mom, but I can see where finding humor can be so important. Things are bound to go wrong and you might as well laugh! I also love your tip about building positive relationships. It can be hard to have the time for that but so very important. I love all of these tips; I need to remember to not let stress overcome me to where I snap at my kids. Great reminder; thank you! I am a working mom and yes it is very stressful. Even I need to have enough sleep, I am a hard time getting it because I have kids to take care of too. It can be so hard to juggle it all! Big hugs, momma! All amazing advice. I can relate as I raised two children who are adults living on their own now. So many great tips on reducing stress! Such an informative great read to let others know they are not alone! This is great article to read especially to all those mother out there. Everything you’ve cited here is on point and very realistic. Great reminder for all of us not just for mother but everybody too. I actually follow most of these things when I am feeling stress as working mom and it works. i love all these tips. mom life is just stressful in general, so any way to decrease it, is much needed! Realistic goals are key. Taking on more than what is possible in a day can lead to frustration. Great post! These are some great tips and they really do help. I do find that if I sleep well and eat the right things, I am a lot less stressed than if I don’t. I am not a mom but I can imagine it can be so hard to balance the career with the family life. I mean I can barely managed my stress levels and I don’t have children yet. Your advice is very welcomed though, lots of sleep and a balanced diet do make wonders. Gosh, I can’t stress enough regular exercise was a game changer for me. That and eating healthier. Great list! These are really helpful tips especially for working mums and I so agree about keeping your sense of humour! I was looking for an inspiring article like this today. Came in at the right time as a gentle reminder. Aw, I’m so glad! It’s funny how some things can just fall into our laps right when we need them. As a mom, I know all about the stress that goes along with that. I love all of your tips, some really great suggestions. Thanks so much for sharing. Amazing pointers! Thanks a lot for the great post. I find eliminating interruptions does magic. Thanks again for the post. Can I also add — soak in a nice warm bath? I had a super stressful day yesterday, but I drew myself a bath, slapped on a face mask and watched some Netflix while I just sat there and soaked. It was divine! Lots of sleep, lots of water, and lots of not taking things too seriously have been the keys to my sanity over the years.